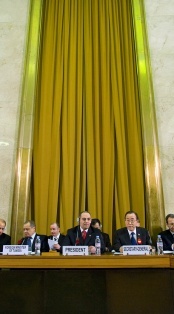 Press Releases related to the 2011 Session of the Conference on Disarmament. This page links to resources and press releases related to the 2011 Session of the Conference on Disarmament. The Conference on Disarmament this morning adopted its annual report to the General Assembly and concluded its 2011 session. During the discussion that followed the adoption of the annual report, speakers expressed their disappointment and frustration with the situation of deadlock the Conference on Disarmament had experienced this year and for the failure of the Conference on Disarmament to implement its own programme of work. South Africa said it remained hopeful for an agreement, while Germany noted doubts that the Conference could fulfil its mandate. Algeria suggested that playing the consensus rule card effectively blocked progress. Pakistan said it found no reason for the Conference to pronounce its failure at this time, and Iran urged the Conference to choose a realistic approach. The United States expressed the hope that the Conference was as close to consensus as many reflected. In his address, Abelardo Moreno Fernandez, Vice-Minister of Foreign Affairs of Cuba, said that Cuba supported the optimization of the disarmament machinery, including the Conference on Disarmament. However, they were convinced that the paralysis currently affecting much of that machinery was a result of a lack of political will of certain States to make real progress, particularly in terms of nuclear disarmament. It was simply unacceptable that in today’s world there were nearly 23,000 nuclear weapons, of which 7,560 were ready to be used immediately. Thus, nuclear disarmament should remain the highest priority in terms of disarmament. They believed that consensus in the framework of this body should be reached on this matter. The Conference could and should adopt, as soon as possible, a comprehensive and balanced program of work that took into account the real priorities on disarmament. In closing remarks, So Se Pyong, outgoing President of the Conference on Disarmament, said that he had conducted bilateral consultations with nearly all delegations in an open, inclusive and transparent manner, even in the inter-sessional period. The focus of his consultations and discussions with the delegations had been on how to revitalize the Conference and what kind of useful work they should do in the absence of a consensus programme of work. He also made no exception to holding informal meetings with the Informal Group of Observer States to exchange views on common concerns regarding enlarging the Conference on Disarmament. During the course of consultations and discussions, he perceived the gaps between delegations as being wide enough that they could not be bridged at this time, due to a divergence of views on substantive issues. He also perceived that there were a lot of misunderstandings between delegations and between groups on each other’s positions with regard to a possible programme of work. During the discussion, one speaker said that the Conference was not a money-consuming discussion forum, but supposedly the sole multilateral negotiating body for disarmament treaties. The dysfunction of this body was now seriously affecting not just the Conference on Disarmament’s credibility, but the entire process of multilateral nuclear disarmament, a situation which many of them could not stand anymore…. Another speaker said that they continued to support the early commencement of negotiations, within the Conference on Disarmament, on a phased program for the complete elimination of nuclear weapons with a specified framework of time, including a Nuclear Weapons Convention…. Other issues that were raised included the establishment of a working group for the revitalization of the Conference, enlarging the membership of the Conference on Disarmament and the increased involvement of civil society organizations in the work of the Conference. Kassym-Jomart Tokayev, Secretary-General of the Conference on Disarmament and Director-General of the United Nations Office at Geneva, reported on the General Assembly meeting that had been held in New York from 27 to 29 July. 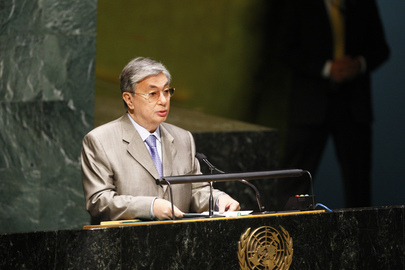 Mr. Tokayev said that the president of the General Assembly said that the grave situation of the deadlock in the Conference on Disarmament had caused the Conference to be put on the agenda of the General Assembly and he encouraged the First Committee to send out a strong signal to the Conference this year. The Secretary-General sent a very strong statement which stressed the urgency of finding a way out of the Conference’s predicament. The Secretary-General noted that members had identified different options to revitalize the Conference, including maintenance of the status quo, incremental changes, or a fundamental approach to the disarmament machinery. To address the differences, the Secretary-General was taking a decision on the establishment of a panel of eminent persons to address the different issues, further to the recommendations of the Advisory Board. It was abundantly clear that there was no easy solution to breaking the impasse. The Conference on Disarmament held a plenary meeting this morning in which it welcomed the new president of the Conference, Alicia Victoria Arango Olmos of Colombia. Ahmet Uzumcu, Director-General of the Organization for the Prohibition of Chemical Weapons, said despite some of the challenges currently facing the Conference on Disarmament, it remained a unique body with an indispensible role. The Chemical Weapons Convention alone testified to the importance of the Conference as the sole multilateral disarmament negotiating forum of the international community. It was concluded successfully because all negotiating parties were prepared to make compromises for the sake of consensus. It was the first and, so far, the only international treaty that banned an entire class of weapons of mass destruction under conditions of international verification. The Convention represented both a political compact and a technical agreement. In his first address to the Conference Mr. Tokayev said that it was a great pleasure to address this distinguished body in his new function as Secretary-General on the Conference on Disarmament…. He had the honour of addressing the Conference nine years ago and at that time he stated that it was imperative to commence work in parallel on various issues, otherwise the Conference on Disarmament would lose credibility and they would have to seek alternative ways of solving the relevant problems. Since that time not much had evolved. They had seen a number of draft proposals to commence substantive work, but unfortunately none of them had led to a way out of the impasse they currently faced. In his farewell statement, Mr. Ordzhonikidze said he believed that the posts he was leaving were among the most difficult and challenging jobs at the United Nations. As this was his final plenary meeting as Secretary-General of the Conference, he wished to express all his appreciation for their professional collaboration. He was committed to the work of the Conference because it was essential for a safer and more prosperous world. 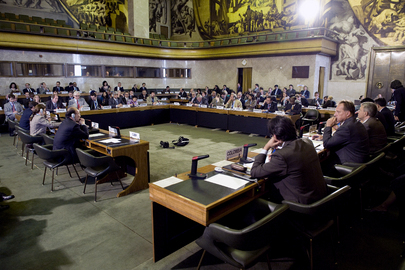 The Conference on Disarmament, the world’s sole multilateral forum for disarmament negotiations, will hold the first public plenary of its 2011 session on Tuesday, 25 January at the Palais des Nations in Geneva.